They say home is where the Wi-Fi connects automatically. And what a great feeling that is. Wireless internet and connected devices simplify everyday tasks in the kitchen, entertainment room, and now throughout the entire home. You feel a connection to your home. But is your home connected? The Aprilaire® Wi-Fi Thermostat with IAQ Control gives you the power to monitor all aspects of indoor air quality so you can be confident your family is living in a healthy, comfortable environment. We think that a connected home is a happy home. See how our Aprilaire® Wi-Fi Thermostat can take your home environment into the digital age and secure your family’s wellness. Most programmable thermostats are anything but intuitive. Clunky designs with mysterious controls can make you too scared to even touch the thing. Aprilaire® made this one different. 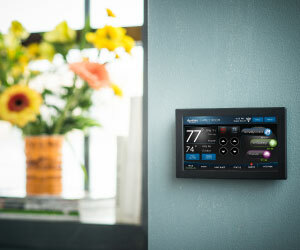 The large touchscreen control makes it easy to set and change temperatures in all areas of your home. You can even sync heating and cooling with your family’s schedule so there’s no wasted energy when everyone is away. Event-Based™ Air Cleaning was designed for families with seasonal allergies and asthma. The system controls your Aprilaire® Air Purifier, letting you set when and how long it cleans the air in your home. Working with your Aprilaire® Ventilation System, the Wi-Fi Thermostat gives you control over the fresh air intake of your home. Whether you do it manually or set up an automatic schedule, the system will let you know when fresh air is pumped into your home, giving you peace of mind that your family is breathing clean, healthy air. Whole-home humidification keeps your home comfortable throughout the year. It’s simple to set up and monitor your Aprilaire® Humidification and Dehumidification systems with the Wi-Fi Thermostat. Still living without whole-home humidity control? See how easy it is to find the right humidifier for your home. Power down while you’re away. If you’re at work and the kids are at school, there’s just no reason to have your furnace or air conditioner running full blast. That way is a thing of the past. The connected thermostat even lets you turn down the heat at night to create more comfortable sleeping conditions.